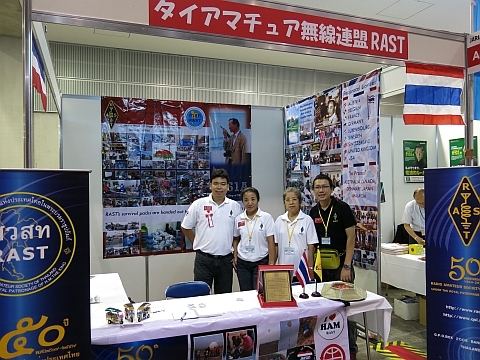 A view of the RAST booth at the Tokyo Ham Fair which took place August 24-25, 2013. Leading the team there was Champ, E21EIC and his wife Goi, E20NKB who are seen here with Chintana and Thirawat, E20JTW. 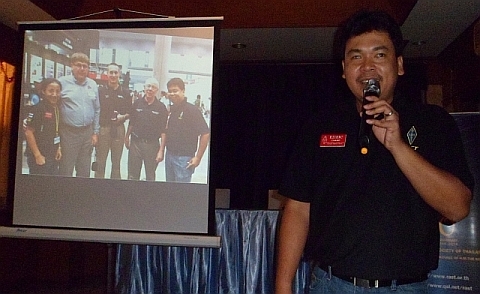 An enthusiastic presentation about RAST's participation in the Tokyo Ham Fair delivered by Chalermphol (Champ), E21EIC was the highlight of the September meeting of the Radio Amateur Society of Thailand (RAST) at Sena Place Hotel on Sunday, September 1, 2013. 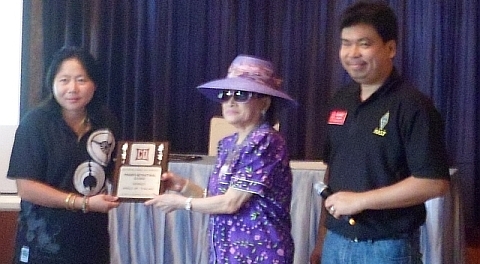 Champ's presentation was made to a large audience of over 50 members and guests following the buffet lunch and announcements made by RAST President Joe (Pornchai). Introducing themselves at the September meeting were returnees Charles, W0DLE from Colorado, Ken, HS0SZU who had been working in the Middle East for many years, VHF contester Pranee, E21DKD and President of the Chiang Mai Amateur Radio Society Thiradej (Dave), HS1LCI. 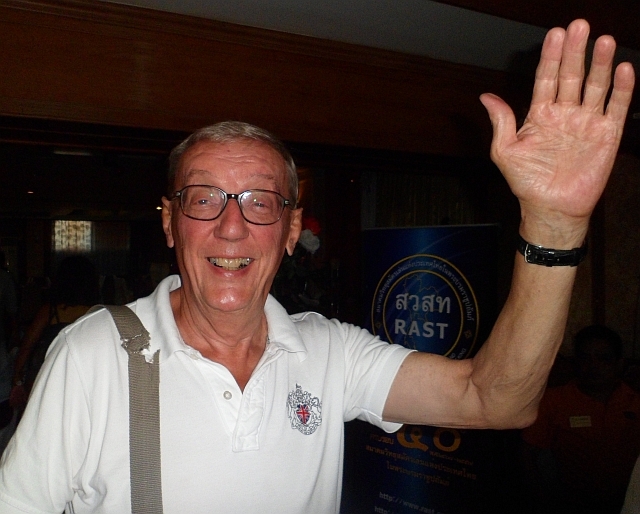 Formalities began with one-minute of silence to mark the passing of RAST life member Heinrich Hans Dreher-Tonja, 72, HS0ZEL who had succumbed to dengue fever in Udon Thani province in July. Then some very good news was announced: After 13 years the waiting was over for RAST's former HS0AC station manager Finn Jensen, HS0/OZ1HET (seen in the photo at left). The bilateral reciprocal agreement between Thailand and Denmark has finally been signed and sealed by the Thai Government, meaning that Denmark now becomes the 10th country to enjoy a reciprocal amateur radio operating agreement with Thailand. Joe then provided an update about the club station HS0AC, saying that work should start in the coming week to refurbish the interior of the building with a new coat of paint, new electrical wiring and sockets along with a new breaker box. After that furniture should be moved in and by the end of the month of September the station should be operational again -- once equipment had been connected to the antennas atop three towers that are still standing. This work should all be completed either just before or just after the October meeting, the RAST President predicted. 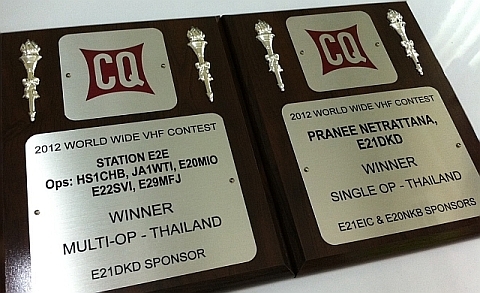 Champ was then invited up to the front of the gathering and he was carrying plaques for the winners of the 2012 CQWW VHF contest in the single-operator and multi-operator categories. 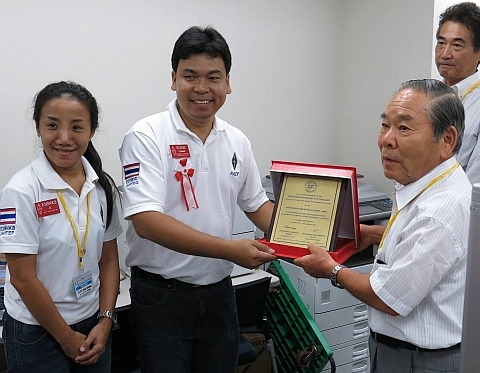 The first plaque, for the single-operator winner in the contest and sponsored by Champ and his XYL Goi, was presented to Pranee, E21DKD by former RAST President Khun Mayuree, HS1YL. The second plaque went to E2E in the multi-operator category and was sponsored by E21DKD who presented the award to Narissara (John), HS1CHB and Noppadol (Mor Dong), E21MIO who represented the operating team that also comprised JA1WTI, E22SVI and E29MFJ. Over the weekend of August 24-25 RAST had Booth A12 in the Tokyo Ham Fair at Tokyo Big Sight. 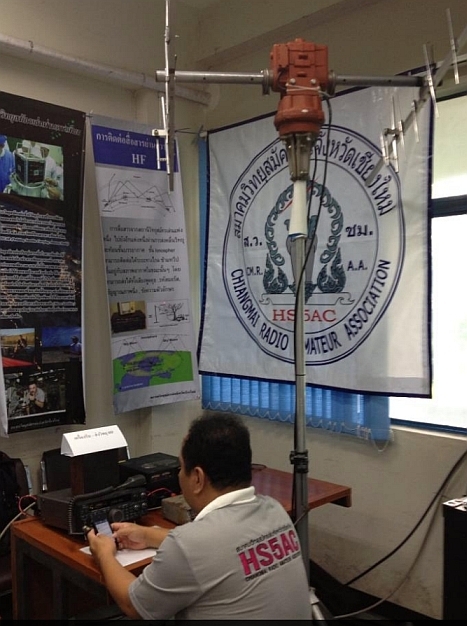 This was a 2.5-metre by 2.5-metre booth that had been decorated with large posters depicting the activities of RAST, including VHF contesting, APRS, field day activities, the HS0AC club station and how hams had helped during the flooding of 2011. 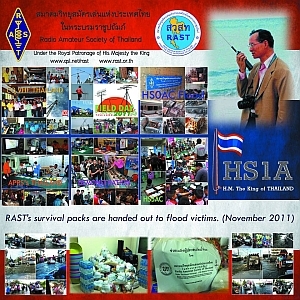 A prominent picture of His Majesty the King speaking into a hand-held transceiver dominated the display which also featured the SI9AM, the King Chulalongkorn Memorial Amateur Radio Society in Sweden, Thailand's recent HF Exam, RAST's participation in the IARU Region 3 conference in Vietnam, the ARRL's VEC exams that are conducted here and how Thailand had been represented in the WRTC of 2006 in Brazil. which were made available to members at the September meeting during a lucky draw following the presentation. Leading the RAST team staffing the booth was Champ, E21EIC and his XYL, Goi, E20NKB and they were assisted by Noppadol, HS5IGY and Thirawat, E20JTW as well as Wara, E21AOY. The team was able to welcome many VIP visitors to the booth along with many high-profile DXers and old friends of Champ. 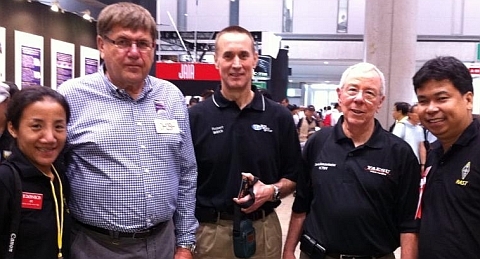 Visitors to the booth included the Presidents of JARL and of ORARI, the Indonesian national society as well as the president of Yaesu, Jun, and Yaesu's executive vice president for North America Dennis Motschenbacher, K7BV who had visited Thailand last year to present two FT2000D transceivers to RAST in support of HS0AC after the flood damage. Champ is seen here with his host and his guide while he was in Japan. 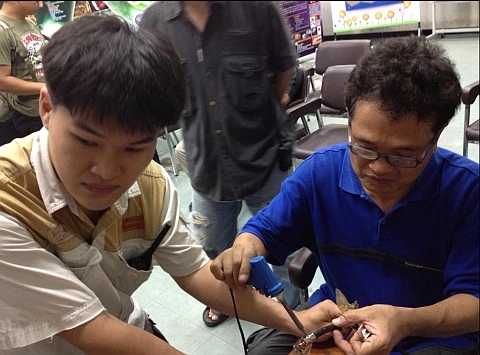 Zorro, JH1AJT (his host) is sitting behind the desk, while Jay Oka, JA1TRC (his guide and mentor) is seen at right. Champ is holding up the QSL card for Zorro's recent activity in Myanmar as XZ1Z and he will be returning there with Champ later this month. Champ showed many photos he and friends had taken during their visit to Japan and he was especially grateful to Jay, JA1TRC "for taking care of us throughout our trip" and to renowned DXer Zorro, JH1AJT who was host to Champ and his XYL while they were in Japan and had generously sponsored food and accommodation for them. Champ presents a plaque on behalf of RAST to Zorro, JH1AJT to the Foundation for Global Children and the International DX Radio Club - 7J1YAJ in recognition of their outstanding efforts and support for RAST members to the JARL Ham Fair 2013. Currently in the news for his recent operation in Myanmar as XZ1Z, Zorro intends to return there -- along with Champ -- from September 17-25 and they will be active from Naypyidaw between September 18 and September 23. 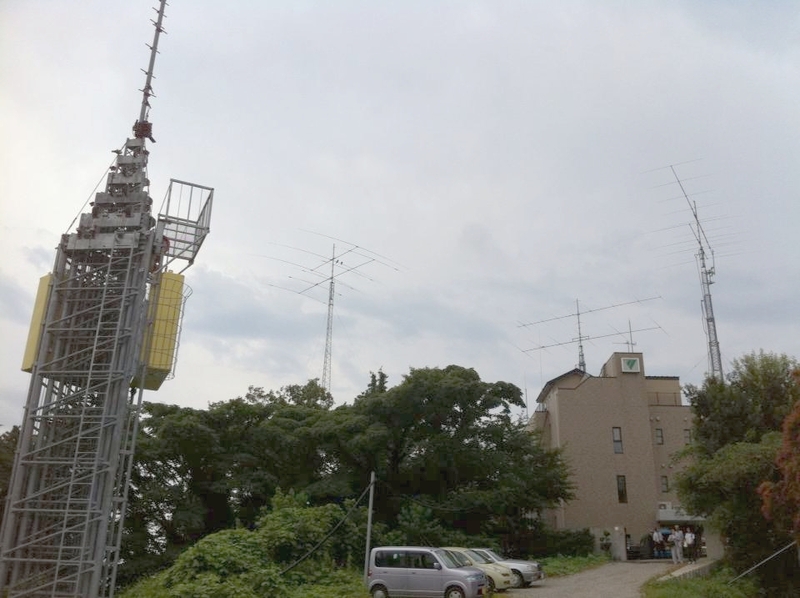 Champ showed impressive views of Zorro's QTH with an array of 10 towers at his home station and also at his neighbouring contest station that has the callsign 7J1YAJ. He also showed views taken inside his shack where there is a separate transceiver tuned to each band. Champ was also honoured by being invited to write his callsign and a brief message on the wall of the shack. 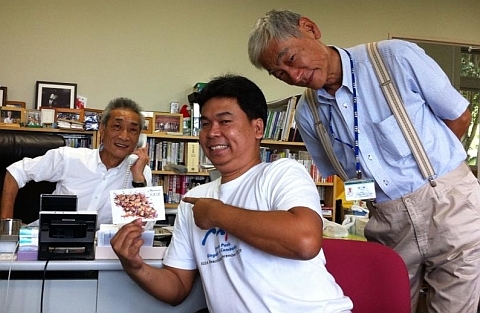 While Champ was in Japan he managed to get on the air and make some 400 QSOs, including 33 with operators in Thailand, using his Japanese callsign JH1TEQ. Zorro and his wife also treated them to a formal tea ceremony along with a welcome dinner party with Zorro cooking the Kobe steak himself, Champ told the audience. The Tokyo Ham Fair had an array of the latest equipment from major suppliers such as Icom, Yaesu and Kenwood while there were also booths catering to various aspects of the hobby, some featuring old equipment (think "Collins"), others featuring digital modes, one had weird antennas while there were various accessories on sale along with a CW operators' booth and a CubeSat (satellite communications) booth. 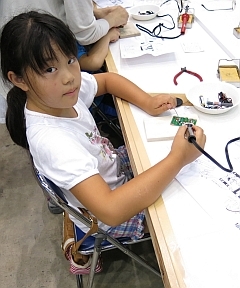 There was also an area where children were soldering together equipment, building them from kits, there was a DXCC booth, a SEANET booth in anticipation of the upcoming convention in Yokohama that will take place from October 5-7 and, like RAST, ORARI, the Indonesian national society also had a booth at the event. 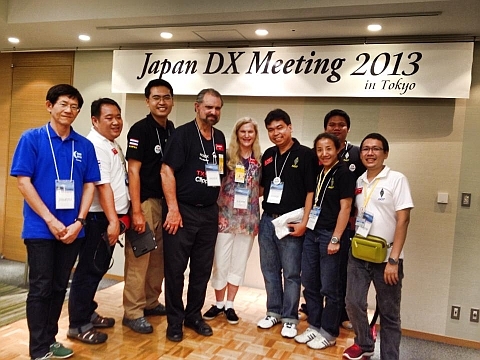 On Saturday evening there was a JA DX meeting with over 200 attending where JA1DM who has 390 DXCC countries confirmed was the undisputed leader. Champ said the he and Goi had met many old friends there. 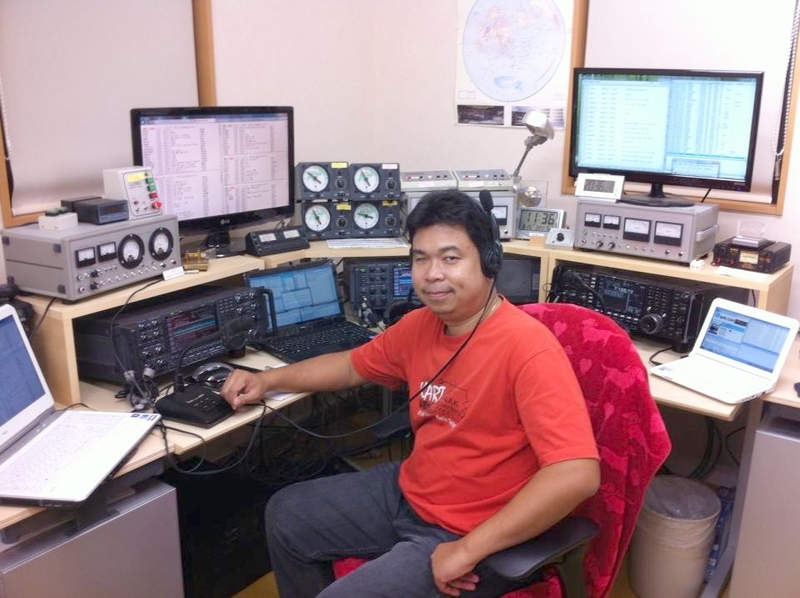 At the DX meeting Champ and the Thai team had a chance to meet many prominent DXers, such as Bob, KK6EK, the leader of the recent Clipperton Island DXpedition. 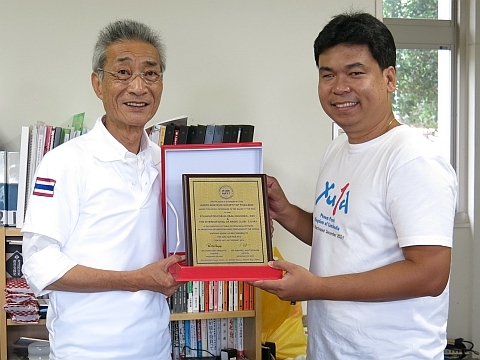 During the event, Champ also presented a plaque "in recognition of their outstanding efforts in the promotion of amateur radio throughout the world" to the President of the Japan Amateur Radio League (JARL), Akira Inage, JA5MG on behalf of RAST. 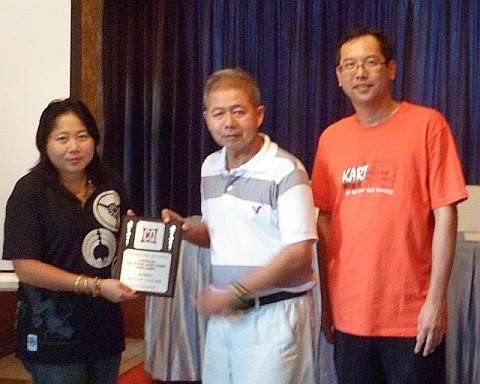 Champ presents the plaque to JARL President Akira Inage, JA5MG on behalf of RAST. At the conclusion of his presentation and following a brief summary in English that was made by Tony, HS0ZDX, Champ then made available some of the souvenirs that had been on sale to visitors at the RAST booth during the Tokyo Ham Fair to those present in the form of a lucky draw. This amounted to some 20 items that included mugs, bags, Yaesu caps and fans that were gratefully received by those whose callsigns or names were drawn from box and this brought the September meeting to a conclusion at around 2.30 p.m. 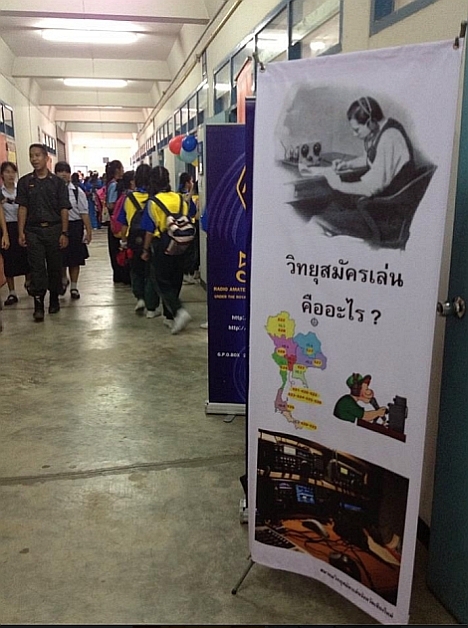 Amateur radio was well represented during the regional "National Science Week" event that was staged in Chiang Mai from August 16-18, 2013 at Chiang Mai University with a big display organised by HS5AC that drew large crowds, especially of young people and schoolchildren. 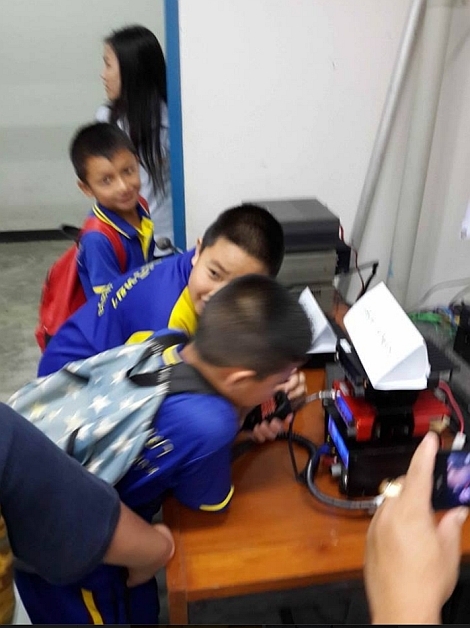 In these pictures, posted on Facebook by HS2TEI, officers of the Chiang Mai amateur radio station can be seen preparing the exhibit and explaining what amateur radio is to visitors. 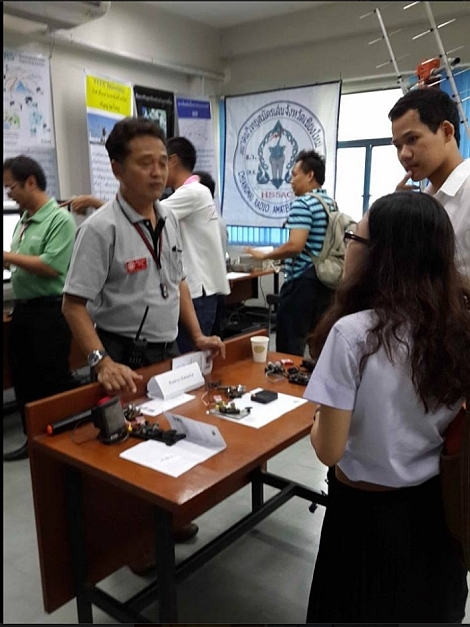 This year's Science Week at CMU intended to provide a science and technology update in preparation for upcoming the Asean Economic Community (AEC) and it was good to see how amateur radio was highlighted at the event. More excellent photos can be found at HS2TEI's Facebook page. 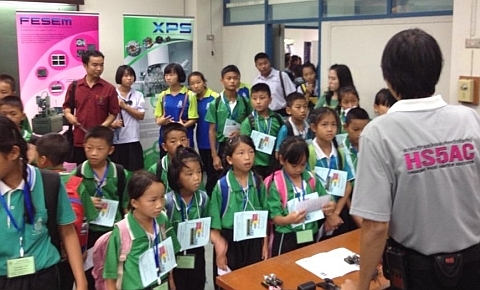 For earlier news about RAST and developments regarding amateur radio in Thailand, please check our the previous archive here.